Half day off in lieu of all the overtime at last - lovely conditions. It's been dry for some days so decided on a whim to visit Summerling carpets. Found out why there's a small dog on their sign - I was greeted by a large cream-coloured Cairn terrier! Got permission to raid the skip, so acquired a biggish roll, stuffed it into the back of the car and reversed it up to the plots. Manoeuvred the carpet onto plot two with the wheelbarrow, and left it to clear some of the middle section. Finished off the digging and moved another self-set sage to near the raspberries. I think that narrow strip is going to get all the permanent herbs since the soil is relatively thin thanks to the apple trees. They ought to do well as a result. Got serenaded by the red featherball which was happy to come and stuff itself with worms off my newly dug plot! Newly dug and manured bed in plot 1 for next year´s squash. 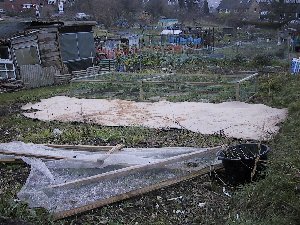 Poor plot 2 - now with large bit of carpet, the leek frame and the sad remains of the carrot frame. With more carpet, time and a bit of digging, it will sort itself out. OK I was being optimistic. There were way more than half a dozen verbascums! But the deed is done. Went up about 11am while it was still murky outside, but not too cold. Went straight into the double sized onion plot, and decided it was all or nothing. Worked my way through the lowermost plot, manuring as I went and evicting verbascums, grass and other weird weeds, then put a board across the lower edge as for the other plots, and so that's now more level. Pulled across the carpet, and then decided my back was not complaining at all so carried on with the upper onion section. Evicted all the resprouting onions, some of which are ok for eating. Cleared out a lot of grass from the sage, trimmed and deadheaded them and shifted yet another baby sage out of the way. Donated two more to Vince! Didn't manure that section as I can't cover it over yet. The cabbage plot's full of chickweed, but also cabbages, so that I can't do anything with yet, and the leek and carrot plots will be going for some time. So I've finished all the bare plot digging. 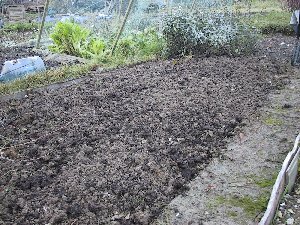 This is the earliest I´ve *ever* managed to get the first plot dug over. Now I can do what I should have done ages ago, and sort out plot 2! More large pieces of carpet are needed first, then I can cover it and dig bits as I need to. Tidied up another plot border (where the beans will go next time) and redid the carpet while I was looking for things to do, and now I need to find a source of wood to do the rest! A lot of the first planting of garlic are now up, so I hope to see the second lot in a couple of weeks. I have to remember that I planted them all way deeper than previously so they will take a while! No sign of the onions as yet. Helped myself to a barrowload of the leaves and stuck them on the rhubarb. Pulled another couple of leeks, another enormous carrot (and several normal sized ones) and then went to South Heath in search of a Christmas holly garland. Got up while it was still daylight and pulled some leeks and carrots for the Christmas Day table, and was also given some sprouts by one of the chaps. I´m not the world´s greatest sprout eater but Dad loves them so I staggered home with a bagful of things. Happy Christmas! We ate well, with nine types of home-grown vegetable simply because we could! The turkey was locally reared and free range, the sausages local, potatoes were my Sárpo maincrops, the stuffing was my sage (though sadly the onions didn´t crop well enough to be in it), then there were marrow, runner beans, French beans, sprouts, cabbage, carrots with garlic, and leeks. The roast potatoes were cheats though. Still, quite pleased and the food miles very few. If I´d been awake I´d have also added some sweetcorn just to finish off, but we had plenty of leftovers for the great fry-up on Boxing day!